Are You Ready for 31 Days of POWERful Bible Journaling? I am so happy to see so many of you joining me for 31 Days of POWERful Bible Journaling! First things first, the winner of the Bible, journal and pens is Zipporah. Thank you for everyone who entered and shared the post. Second, this is how I see the next 31 Days working. Print off your 31 Day POWERFUL Bible Reading Challenge tracking sheet. It is a freebie for email subscribers. If you are a subscriber, it will be shown as a link at the bottom of every email you receive from The Littlest Way. If you are not an email subscriber, click here to sign up. Daily, please God, I will post my POWER reflections and maybe something I’ve found in further reading that corresponds to what we’re reading or what I’ve reflected on. Please keep in mind, I am a wife and mother first so posts may be late, hopefully not, but just in case. I would love it if you all would share your POWER reflections in the comments. Please. I want to see how this looks for others. I don’t have a Bible study group here in person. You all are my Bible Study girls and I want to see how you’re doing it. Again, please. I want some back and forth, just like I would imagine a real life, in person Bible study operates…although I’m just guessing, I’ve never been a part of one. Finally, any questions? Leave them in the comments or email me. With that, I will see y’all Saturday, August 1st! Oh wait, one more thing. We are about to begin something great! wonderful! and necessary for the good of our souls! Beware of the enemy! He is going to try to trip you up coming and going. Stand strong!! Be faithful!! Let’s keep each other in prayer especially during this time. 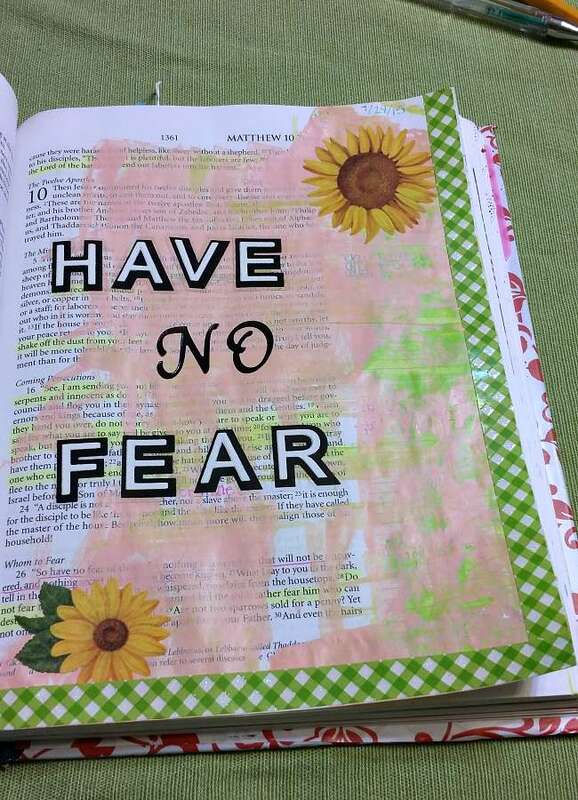 *I know I said before I wasn’t comfortable actually covering the words of scripture in Bible journaling, but last night I tried it. Yeah, not comfortable actually covering the words on the page, now I know for sure, even though I do like the way this page turned out. More on this process later. I’m in the South/Mid West and there are lots of Bible study groups, just not lots of Catholic Bible study groups. Plus it is hard with children and homeschooling to make the time to commit to an hour or more away from home. Thanks, Jenny! I’m super excited to get started!